Perhaps a portent of things to come was the beautiful Saturday morning, with that most welcome light breeze that allows one to enjoy the sunshine whilst feeling as warm as a new bun. So, I made my way to The Meeting Place – Quakers Building in Leicester. This was my first adventure to a Poetry book launch, and my first visit to this fantastic building. Emma began by explaining the reasons for the book title and the cover design. 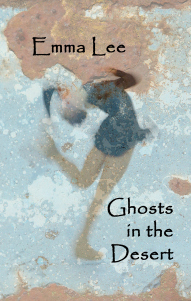 Unknown to me at the time ‘Ghosts in the Desert’ isn’t just one theme or even a single poem, but a series of poems that consider the effects of ‘Loss’ and ‘Relationships’. I did enjoy this engagement as one begins to see the work and thought that goes into bringing poetry together in a way that allows it to be called a ‘Collection. We were treated to some readings from Emma. The readings have made quite a difference to my understanding of poetry, although, in spite of Emma’s explanations, I still feel I am like a first day student who doesn’t even know his way around the building. I did, however, begin a journey of appreciation in understanding the difference between communicative prose and that heightened aesthetic structure of metaphor that is poetry. Finally, Emma took questions from the floor and I got to ask about the discipline of when one knows a poem is finished. It could have been the weather or even the scrumptious cakes, but I felt inspired to frame my question by using a metaphor about baking. Emma, explained that it is less instructive and more intuitive and that one instinctively knows; through experience and hard work, that a poem has come to an end when the poet feels it thus. This suggests to me that knowing when to end something on the aesthetic structure is part of the whole process which themes, constructs and ends a poem. It is all about the senses. On my way home I considered this notion and concluded that we trust the poet to deliver in the knowledge that they use all their senses to ensure, that everything is utterly controlled, but for us the readers we see only what is presented as something that is elegantly contained, where all the — hard work has been elided. A most engaging afternoon.